Y by Yumi, 3D Flower Chiffon dress is perfect for an unexpected evening look. 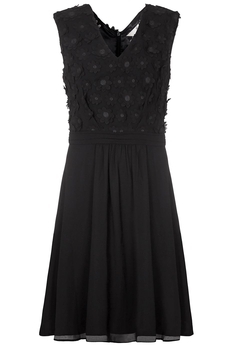 Beautifully crafted, this sleeveless skater dress features a V-neckline and embellished 3D-florals adorning the top. Finished with a lightweight chiffon floaty skirt and a zip fastening down the back. Is fully lined and is approx. 100cm in length. Winter collection. Composition: 100% Polyester. Color: Black.